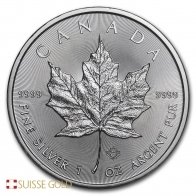 Canadian Maple Leaf Silver Bullion 1 oz (.9999 pure) - Dates of our choice. 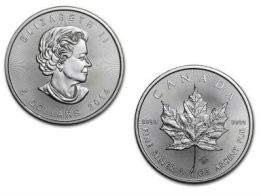 The Canadian Maple leaf coin is available in gold, silver, platinum and palladium. 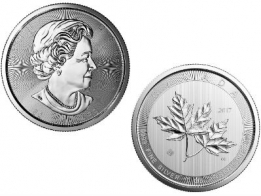 The Canadian Maple leaf silver coin is available as a single coin, in a tube of 20 pieces, or in a monster box for individuals looking to invest in silver. Comes in a box of 500 coins, in uncirculated condition. 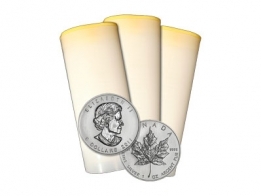 Contact us to sell your silver maple leafs.